At a family gathering with friends in Rhode Island on Thanksgiving 2011, then-11-year-old Eric Zeiberg, a sixth- grader from West Hartford, began a quest. One of the friends has muscular dystrophy and has trouble speaking. To compensate, she had been texting on an iPad, which converts the text to a voice. But there’s a problem, she said. Eric decided to try to create such an app, hoping that it might also help his sister Julie, 23, who is autistic and has speech disabilities. 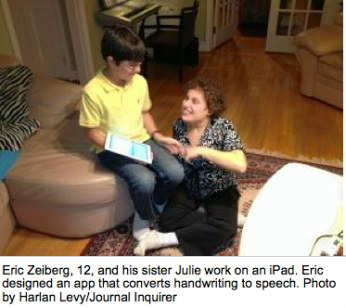 Thus began a process that ended on Dec. 2 with the debut of HandySpeech at Apple’s app store, the only handwriting-to-speech iPad — and iPad Mini — application to help people with autism, Lou Gehrig’s Disease, stroke, muscular dystrophy, and post-operation voice difficulties. It’s easy to use — just use a finger or a stylus to write in the yellow section at the bottom of the iPad screen, then hit the speech button, and the writing turns into a male or female voice. But HandySpeech wasn’t easy to produce. Eric also gained two partners — text-to-speech software company iSpeech and handwriting recognition software maker PhatWare. Apple had to approve the application, which is far from automatic. For Eric, it took only about a week. Easy for him, that is. The 70 people who bought this versatile app so far — for $29.99 — can write and “speak” in 11 languages, including Dutch, French, German, Danish, Spanish, Swedish, Norwegian, Finnish, Italian, U.S. English, British English, and Portuguese as spoken in Brazil and as spoken in Portugal. The app also provides for automatic corrections, learns user writing patterns, and allows simple finger gestures to insert special characters such as space and return. • Phrases: you’ll be able to scroll down a list of phrases such as “Please wait while I am writing” or “How are you?” and click on any one, and a voice will say it. • Speech speed control, so you can slow down or speed up the voice. • Ability to upload the app to an iPhone.